This chopper is still new. Warranty table 2year-30000km. It is a fuel saver. Kilos are 671km it is a 2014 model it is manuel and silver in colour. Buyer gets a new jacket a new helmet and a pair of gloves. I have a 250 cc Motomia Java scooter for sale, it is silver in colour and has very low mileage. 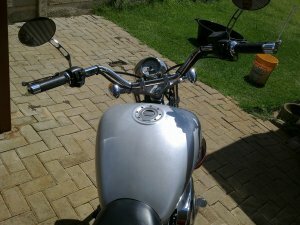 …14 900km Very good condition Papers and road worthy.